In the first part of our brief story of GPS we told you how latitude and longitude values got to be determined. This made the great European powers to become even greater, allowing them to extend and through colonisation become inter-continental Empires. But one of the colonies was to become a great Empire in its own right. And even if the very short history of the USA as a colony (yes, it’s the USA we were talking about) is related to the navigation knowledge the original conquerors, today it is the one undisputed leader of the world’s means of navigation…. and tremendously much more, as you find out soon. “The Empire striked back“, George Lucas would probably comment on that one. But back to the “how it works” part, the starting point of any location-determining was observing celestial bodies in the sky. And this is still the case today except that we’ve also imagined, built and sent up to the skies our own stars to support the job. The word “satellite” comes from the French similar word which in its turn originated from Latin and it meant “companion” or “assistant“. Quick example to better understand the concept, it’s just like how in any family the husband is the satellite of his wife. The same happens in astronomy, too, the difference being that in astronomy the 2 involved parts are bound by gravitational means not by a certificate, one common point though being that there’s no easy way to escape. In 1978 the US military launched the first satellite of what will eventually become known as the Global Positioning System, GPS. And launches of such specialized satellites continued almost uninterruptedly eversince. During the 90’s the targeted number of a 24 satellites constellation was reached and exceeded but launches keep going on, of course, for obvious reasons of maintenance and upgrades. The GPS as we know it today works based on a fixed number of 24 operating satellites along with some additional ones, as spares (actually the 24 number was expanded to 27 less than 3 years ago, but don’t let us waste your time with too deep details). The idea behind the “24” number is that at any given moment for any given point on Earth there should be at least 4 satellites available within the “visibility” range of that point while the idea behind this “4” number is a consequence of the way location is determined. Each GPS satellite (a piece of machinery weighing some 2 tones and being cca. 5 meters long across its extended solar panels) is orbiting the Earth twice each day, the orbit being about 20.000 km. far from Earth, an optimal zone for many reasons, one of them being that not many suprising events happen there, allowing easier anticipation of trajectories. Each satellite continuously broadcasts a digital message as microwave signals and all satellites use the same fixed frequency (actually there are more, including encrypted ones which are strictly reserved for military use, but again, let’s not go into too much details). The digital message has an exact and well-known structure (in both terms of time and assigned bits) and basically consists of 3 parts: a first part containing the exact time when it was generated according to satellite’s internal atomic clock, a second part (the “ephemeris“) containing precise orbital data of the satellite and a third part (the “almanac“) that is common for all satellites and contains a synopsys on the entire constellation and some error correction data. So the “time-stamps” data are generated by the satellite itself due to its on-board atomic clocks but the ephemeris and the almanac are being regularly updated and uploaded to the satellites from the ground control system on Earth, which continously and rigurously monitors orbiting-status and health-status information for all satellites of the GPS fleet. Now for the GPS-receiver: it is tuned for the exact frequency used by GPS satellites, it knows the exact structure of GPS messages, it knows how to differentiate which signal belongs to which satellite and it knows exactly which satellites are available on its location at that moment (based on the almanac information). Such high level of specificity explains why GPS receivers can reach such small sizes and be such low power consumers. The receiver generates internally the same message broadcasted by satellites and by comparing the 2 out of sync versions (the satellite version is delayed as it has to travel more than 20.000 km until reaching the receiver) it makes the necessary time adjustments until the 2 versions (the generated one and the listened one) are perfectly synchronised. The “amount” of adjustment applied until perfect sync was achieved is a time value at nanoseconds scale which, if multiplied by the speed of microwaves traveling from the satellite down to the receiver (it is the speed of light with some absolutely necessary corrections applied) gives nothing else but the distance between the satellite and the receiver. 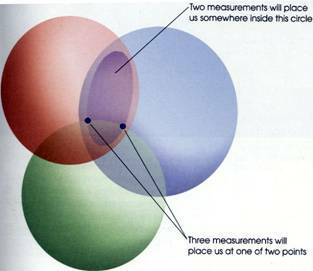 From a mathematical point of view, knowing 3 such distances (from the GPS receiver to 3 different GPS satellites) would be enough to determine the location of the receiver because the 3 spheres having the 3 GPS satellites as centers and their respective distances down to the GPS receiver on Earth would intersect in only 2 points, one of which is highly improbable. This geometrical technique of determining the position of one point in space based on 3 known distances is called “trilateration” and it is commonly mistaken with the trigonometric technique called “triangulation “. Actually, even “trilateration” isn’t the perfect term to be used because in fact, the receiver listens to at least 4 satellites (which explains the number “4” we’ve mentioned above when talking about the reason behind the 24 number of satellites constellation). And here is why: in order for trilateration to work “ad-literam“, distances have to be perfectly determined. But to achieve that, a minimal requirement would have been at least for the receiver to have its own atomic clock to get in sync with the satellites ones, given the incredibly small fractions of time involved in the process (an error of just 1/1000 of a second in time translates into some 300 km in space positioning!). Atomic clocks incorporated into the GPS receiver is, of course, out of the question so some clever trick was desperately needed to appear…and it did: instead of 3 perfect measurements, why not use 4 imperfect ones? It would work like this: the GPS receiver computes a trilateration using 3 GPS satellites but when cross-checking the result using a 4th satellite…well…there will be no match, of course, because as we already know, we’re operating with imperfect values. So why not figure-out (i.e., by means of let’s call it “creative subjective deduction” instead of the “boring objective measurements“) the one and only magic correction value (keep in mind that any offset from universal time affects all measurements) which would put them all in sync? Well, this principle did put everything in sync, indeed. It also explains why GPS receiver’s internal clock needs just a “humble” oscillating crystal to briefly perform as if it were an 100.000 USD atomic clock, allowing for extreme size minimization and applicability maximization. GPS is our world’s referrence for orientation in space and time; it literally synchronises humankind. Banks relies on it to synchronise worldwide operations but also to get each ATM location and also as a most discrete spy, so small it can be hidden amongst packs of money to trace their route. Biologists use tiny GPS transmitters to tag and trace wildlife’s whereabouts like never before. Power grids (a domain where timing is crucial but most of us don’t realise this until the lights goes down) found a comfortable solution to stringent coordination needs. And it looks like constructions will soon be done by GPS-driven machines requiring nothing else than the architect’s design blueprints, they will take care of anything else in an automated way, no need for further human intervention. We’ve intentionally skipped everything related to human navigation (or movements, for that matter) as these are already well-known appliances. Everything mentioned but -most of all- everything not mentioned here can use of this marvelous service for free. And it is paid for, the US tax payers are taking care of those bills, they always did and keep on doing it as we speak. In 1983, US president Reagan made the military GPS service freely available for civilian use, as a common good. And its “Selective Availability” on-purpose error generating feature to keep civilians away from possible intrusion with any military was wiped away by US president Clinton starting 01 May 2000. It goes without saying that other super-powers such as Russia, China or the EU are developing their own global navigation satellite system. ready for upcoming years, the European GALILEO is currently being build and finally the Indian Regional Navigational Satellite System (IRNSS) should be up and running above India skies in 2015, according to schedules. Russian GLONASS is not only same age as the american GPS, it is also fully worldwide operational. And it makes huge marketing efforts to get as many users as possible too. So no wonder that many mobile devices manufacturers are currently supporting both GPS and GLONASS. Just like in the case of the internet browsers or the internet search engines wars, all we users facing the embarassing variety of choices (“embarras du choix” to put this back into its French nativity) all we can do is to experience some kind of terrified happiness. Lighten up, folks, this article ends just about here so just look at this bright side! To get best orientation into document imaging technologies you just have to keep observing the evolution of the shiny GdPicture.NET SDK as one of the most important referrences, along with its pleiade of natural satellites, PaperScan, ORPALIS PDF Reducer, ORPALIS Virtual Barcode Reader Free and ORPALIS DICOM Viewer Free! And the latest satellite we’ve very recently launched to your skies, the ORPALIS MICR-engine demo is a science paradox: it seems that during launching it had one bright side (called CMC-7 font encoding) and a dark side (the E-13B font encoding, as not being released yet at that time). It seems that our MICR-engine demo is the only celestial body in the Universe able to shine to any given viewer with both sides at the same time: same brightness in CMC-7 and E-13B!